Hodenhagen, Germany, 23 August 2017 – “Serengeti Interactives” will change the way how visitors will experience their zoo visit. Being the first in the world, visitors of Serengeti- Park Hodenhagen are not only able to observe the animals but will get the opportunity to interact with the animals thereby stepping into the role of the animal caretakers. Through several placed themed objects in the Serengeti-Safari, visitors can activate different functions to contribute to the well-being of the animals. Visitors can remotely activate brushes for scrubbing, water for drinking, food for eating, sounds for hearing and salt blocks for licking thereby improving the animal's physical and psychological health called ‘behavioral enrichment’. Visitors can also take a selfie with the beautiful themed objects as background. To use the “Serengeti Interactives” visitors only have to install the Serengeti-Park app and they are ready to go. The company who brought this idea to life is Jora Vision, being responsible for the design and production of the “Serengeti Interactives” together with the team of Serengeti-Park. “We do not shy away from a challenge but when Fabrizio first pitched to us his idea, we were scratching our heads” explains Robin van der Want, Project Development Director at Jora Vision. “Although the general working sounds easy, the complexity is fierce. In close collaboration with the animal caretakers we first defined the dos and don’ts of the interactive functions in relation to the animal welfare. Through their daily work, the animal caretakers know what the animals like. We have included some of their favorite things. Secondly we have chosen the locations in the Serengeti-Safari and with that a themed design that fits into the area surrounding. Thirdly all mechanics, electronics and necessary software has been developed and written. Finally everything has been integrated together with the special designed app (Von Affenfels, Germany), bluetooth beacons and all ground works on site. All effort has resulted into the launch of two “Serengeti Interactives”. 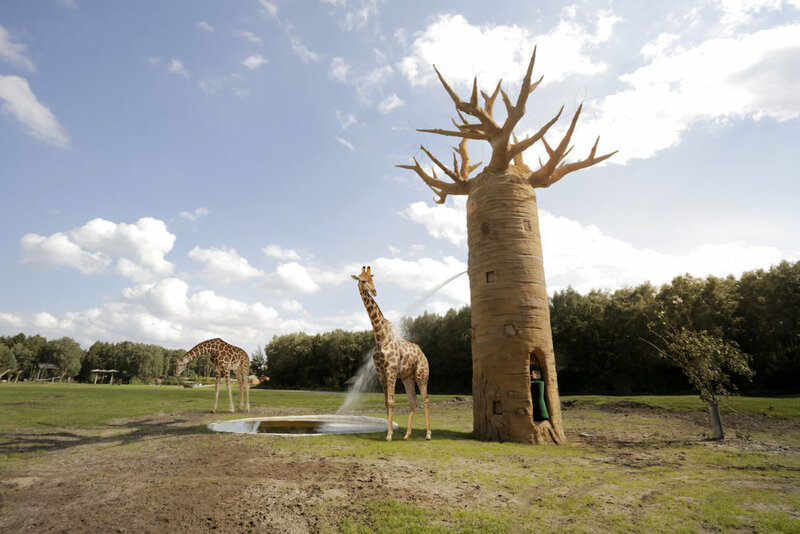 One interactive in the East Africa section, disguised as a 13 meter Baobab Tree and three in the North America section themed as Totems. The heart of the system is the app through which visitors activate the different functions of the Baobab and Totems to interact with the animals. Some functions being free of charge, others between 1 to 3 euro. “We are proud to have been part of this project since we believe that interactivity and immersion - designed to unlock emotional responses - are rapidly becoming essential and proven tools that engage people and ‘make them care’. This philosophy has now been added to Serengeti-Park in a unique way for visitors to enjoy!”, concludes Robin.